So today, I’m showing you my spool holder! I love this little thing – not only is it attractive in a simple sort of way, but it’s downright handy! Now, admittedly, much of the embroidery floss we use for stitching comes on skeins, not spools. But there are many sorts of fine embroidery threads that do come on spools – take, for example, many of the Au Ver a Soie threads, or Trebizond, or Accentuate and Bijoux. 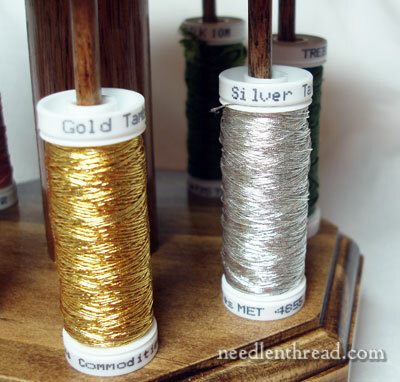 Metal threads often come on spools (passing threads, fine braids, and so forth), too. 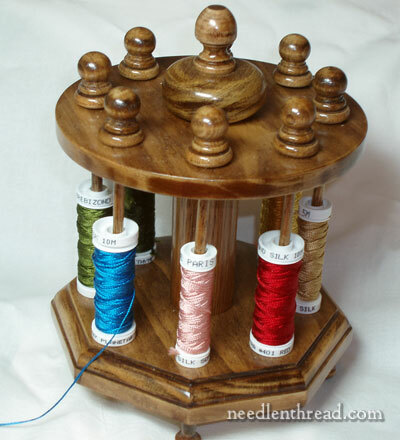 Spools are just something that a needleworker is bound to run into! 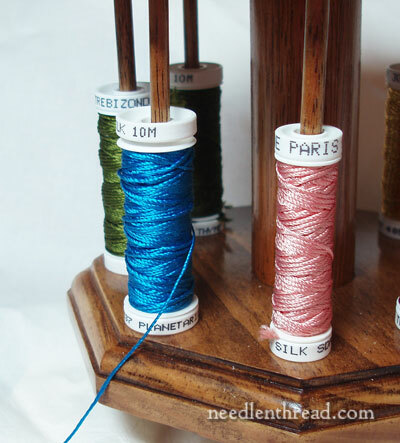 When using embroidery threads that come on spools, a spool holder helps to keep threads on hand, organized, in one spot, and clearly visible. The disadvantage to my (small) spool holder is that it only has 8 spindles. I’ve seen double-decker versions of antique spool holders and always rather drooled over them. I’ve seen the type that have a pin cushion situated at the top of the holder, and, admittedly, I’ve coveted them, too. For example, I’m quite taken with Helen Stevens’s Bobbin Joe. It’s simple in design and totally functional – though I’d dearly love to have something similar, with 8 spindles… and maybe even two layers of 8 spindles. (Greedy Me.) Incidentally, there’s this deliciously beautiful mahogany spool holder on eBay that is pretty close to my Dream Spool Holder… except in price. Yeesh! Ah yes, I like my little spool holder – kind of humble, very simple, made out of various stained dowels more or less, though dressed up a bit with finials. I am quite fond of it. For some reason, it makes me happy. Come to think of it, these things might even have a more pleasing name than “spool holder.” But I have no idea what they’re called. The mundane appellation of “spool holder” seems a bit blah, doesn’t it? Have you noticed that embroiderers tend to lean towards the Decorative in their tools? I think that’s ok, though. Don’t you? It’s a lovely spool holder (or whatever else it might be called). I’m quite envious! It’s no surprise though that embroiders want pretty as well as functional really – given that most embroidery is about making things more attractive! I need a special gimp holder I think! I wish more threads came on spools. Mary, your holder is lovely, but I think you need a bigger one! I see that the one on ebay is currently on sale. How can you resist???? Gorgeous device. You don’t say – does the top lift off? Does it turn? Took a look at your links. The wooden cabinet is scrumptious, but “a bit” out of my price range. I keep many of these spools in a similar plastic case, the Slimline Storage box advertised by Sulky: http://www.sulky.com/slimline/index_slimline.php. The prongs can be tilted individually. Have been fortunate to pick them up at JoAnn Fabrics when onsale or with a coupon. The one disadvantage to me is that when I buy new threads, I then have to shift them to keep them organized. For my Rainbow Gallery Threads, I picked up some of their Stash Boxes a few years ago – some of the “as-is” shipment. 9 sections that hold the RG cards nicely. Ah, the ever-expanding stash! So why is it always missing the color I need? I think you are right there about Embroiders and decorative tools, but I don’t think it’s confined to us! I think women in general seem to be attracted to “pretty” things. I have always wanted an ornate dressing table set with the handmirror, brush and comb. It would be completely impractical, but I still want one! I always buy pretty scissors, even though a lot of the time I am disappointed by their functionality! There is just something about having lovely tools to work with. It is true in any medium you work with. Brushes in painting, the better the brush the nicer the results. Sharp well honed tools for woodworkers give the best cuts. Lovely chatelaines, fine scissors, elegant needlecases and spoolholders are all a part of the fine art of needlework. Your spool holder is lovely. I have a vintage spool holder similar to yours, but haven’t put it to use. I need to find some brass rod to replace a few of the originals. It also has a small drawer at the bottom and a pincushion on the top of the center rod. Yes, a 2×4 with dowels or small-headed nails would work. But doesn’t working with nice tools just seem nicer? Unless you are like I am sometimes and deem it “too nice to actually use”. Dear Mary I really love your spool holder, so classic and useful too. The other day I saw the ultimate storage cupboard in a local craft magazine. If ever I get a nice windfall, this is what I will spend it on. The cupboard folds open and has a magnificent storage space. You can go and have a peek at http://www.stylishstorage.co.za . The retail price would be +- $1600.00 Love Elza Bester Cape Town. I’ve thought about taking one of these classes a couple of times. I still would like to do it one of these days. You had to show us this didn’t you? Now I’m coveting one too!! Veeery nice! I use very few threads on spools or cops so something like this would be wasted. I agree that lovely tools are a joy to use but I have learnt over the years that this doesn’t necessarily mean they are also pretty, eg. my best scissors are Gingher, but they are plain chrome-plated. My husband is a fine woodworker and he made me a lovely albeit plain wooden box for my 3 pairs of scissors to go in. No doubt he could make a pretty nice one of these gadgets too … if only I needed one, lol. Sorry, I was just re-reading these posts and it occurred to me that Gail might find her brass rod at a hobby store – railway modellers use all kinds of brass bits so look for a supplier specialising in that field. I agree; it would be sacrilege to use dowel or nails instead of the original brass rod.